In the world of federal information technology, it is hard to separate satellites from data centers. Thought it would be time to bring in Tom, Stroup, President of the Satellite Industry Association to talk about the impact satellites have on current federal projects. 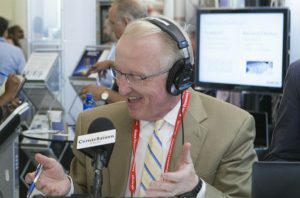 Tom began the interview by talking about big trends in the satellite industry. For decades, many have thought of satellites as being as big as a bus. Today’s satellites can be much smaller, in fact there was a recent conference in Utah with a focus on small satellites, called SmallSat. These small satellites can be sent into space in groups called constellations. This kind of flexibility gives commercial innovators many new capabilities that were only dreamed of years ago. Satellites and the federal government combine to provide data for a wide range of agencies. Other technologies like High Throughput Satellites have created much interest in the federal community. They can provide new ways to serve emergency situations as well a giving the warfighter better information. Tom Stroup talked about the lifecycle of a large satellite – many are ending their contractual life and federal agencies are looking at new options. Jeff Bezos and Elon Musk have made satellites trendy again – listen to the interview to see how your agency can benefit from the tremendous growth in the satellite market.